"Edward III" and "Edward of Windsor" redirect here. For other uses, see Edward III (disambiguation) and Edward Windsor (disambiguation). Edward was born at Windsor Castle on 13 November 1312, and was often referred to as Edward of Windsor in his early years. The reign of his father, Edward II, was a particularly problematic period of English history. One source of contention was the king's inactivity, and repeated failure, in the ongoing war with Scotland. Another controversial issue was the king's exclusive patronage of a small group of royal favourites. The birth of a male heir in 1312 temporarily improved Edward II's position in relation to the baronial opposition. To bolster further the independent prestige of the young prince, the king had him created Earl of Chester at only twelve days of age. In 1325, Edward II was faced with a demand from his brother-in-law, Charles IV of France, to perform homage for the English Duchy of Aquitaine. Edward was reluctant to leave the country, as discontent was once again brewing domestically, particularly over his relationship with the favourite Hugh Despenser the Younger. Instead, he had his son Edward created Duke of Aquitaine in his place and sent him to France to perform the homage. The young Edward was accompanied by his mother Isabella, who was the sister of King Charles, and was meant to negotiate a peace treaty with the French. While in France, Isabella conspired with the exiled Roger Mortimer to have Edward deposed. To build up diplomatic and military support for the venture, Isabella had her son engaged to the twelve-year-old Philippa of Hainault. An invasion of England was launched and Edward II's forces deserted him completely. Isabella and Mortimer summoned a parliament, and the king was forced to relinquish the throne to his son, who was proclaimed king in London on 25 January 1327. The new king was crowned as Edward III at Westminster Abbey on 1 February at the age of 14. It was not long before the new reign also met with other problems caused by the central position at court of Roger Mortimer, who was now the de facto ruler of England. Mortimer used his power to acquire noble estates and titles, and his unpopularity grew with the humiliating defeat by the Scots at the Battle of Stanhope Park and the ensuing Treaty of Edinburgh–Northampton, signed with the Scots in 1328. Also the young king came into conflict with his guardian. Mortimer knew his position in relation to the king was precarious and subjected Edward to disrespect. The tension increased after Edward and Philippa, who had married at York Minster on 24 January 1328, had a son on 15 June 1330. Eventually, Edward decided to take direct action against Mortimer. Aided by his close companion William Montagu and a small number of other trusted men, Edward took Mortimer by surprise at Nottingham Castle on 19 October 1330. 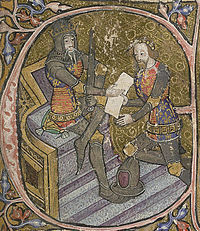 Mortimer was executed and Edward III's personal reign began. 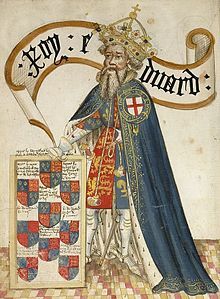 Edward III was not content with the peace agreement made in his name, but the renewal of the war with Scotland originated in private, rather than royal initiative. A group of English magnates known as The Disinherited, who had lost land in Scotland by the peace accord, staged an invasion of Scotland and won a great victory at the Battle of Dupplin Moor in 1332. They attempted to install Edward Balliol as king of Scotland in David II's place, but Balliol was soon expelled and was forced to seek the help of Edward III. The English king responded by laying siege to the important border town of Berwick and defeated a large relieving army at the Battle of Halidon Hill. Edward reinstated Balliol on the throne and received a substantial amount of land in southern Scotland. These victories proved hard to sustain, as forces loyal to David II gradually regained control of the country. In 1338, Edward was forced to agree to a truce with the Scots. One reason for the change of strategy towards Scotland was a growing concern for the relationship between England and France. As long as Scotland and France were in an alliance, the English were faced with the prospect of fighting a war on two fronts. The French carried out raids on English coastal towns, leading to rumours in England of a full-scale French invasion. 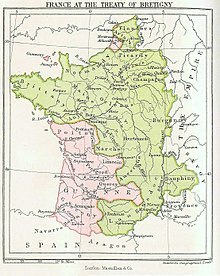 In 1337, Philip VI confiscated the English king's Duchy of Aquitaine and the county of Ponthieu. Instead of seeking a peaceful resolution to the conflict by paying homage to the French king, as his father had done, Edward responded by laying claim to the French crown as the grandson of Philip IV. The French rejected this based on the precedents for agnatic succession set in 1316 and 1322. Instead, they upheld the rights of Philip IV's nephew, King Philip VI (an agnatic descendant of the House of France), thereby setting the stage for the Hundred Years' War (see family tree below). In the early stages of the war, Edward's strategy was to build alliances with other Continental princes. In 1338, Louis IV named Edward vicar-general of the Holy Roman Empire and promised his support. As late as 1373, the Anglo-Portuguese Treaty of 1373 established an Anglo-Portuguese Alliance. These measures produced few results; the only major military victory in this phase of the war was the English naval victory at Sluys on 24 June 1340, which secured English control of the Channel. Meanwhile, the fiscal pressure on the kingdom caused by Edward's expensive alliances led to discontent at home. The regency council at home was frustrated by the mounting national debt, while the king and his commanders on the Continent were angered by the failure of the government in England to provide sufficient funds. To deal with the situation, Edward himself returned to England, arriving in London unannounced on 30 November 1340. Finding the affairs of the realm in disorder, he purged the royal administration of a great number of ministers and judges. These measures did not bring domestic stability, and a stand-off ensued between the king and John de Stratford, Archbishop of Canterbury, during which Stratford's relatives Robert Stratford Bishop of Chichester and Henry de Stratford were temporarily stripped of title and imprisoned respectively. Stratford claimed that Edward had violated the laws of the land by arresting royal officers. A certain level of conciliation was reached at the parliament of April 1341. Here Edward was forced to accept severe limitations to his financial and administrative freedom, in return for a grant of taxation. Yet in October the same year, the king repudiated this statute and Archbishop Stratford was politically ostracised. The extraordinary circumstances of the April parliament had forced the king into submission, but under normal circumstances the powers of the king in medieval England were virtually unlimited, a fact that Edward was able to exploit. 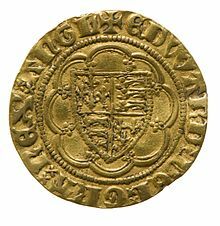 Historian Nicholas Rodger called Edward III's claim to be the "Sovereign of the Seas" into question, arguing there was hardly any Royal Navy before the reign of Henry V (1413–22). Despite Rodger's view, King John had already developed a royal fleet of galleys and had attempted to establish an administration for these ships and ones which were arrested (privately owned ships pulled into royal/national service). Henry III, his successor, continued this work. Notwithstanding the fact that he, along with his predecessor, had hoped to develop a strong and efficient naval administration, their endeavours produced one that was informal and mostly ad hoc. A formal naval administration emerged during Edward's reign which was composed of lay administrators and headed by William de Clewre, Matthew de Torksey, and John de Haytfield successively with them being titled Clerk of the King's Ships. Sir Robert de Crull was the last to fill this position during Edward III's reign and would have the longest tenure in this position. It was during his tenure that Edward's naval administration would become a base for what evolved during the reigns of successors such as Henry VIII's Council of Marine and Navy Board and Charles I's Board of Admiralty. Rodger also argues that for much of the fourteenth century, the French had the upper hand, apart from Sluys in 1340 and, perhaps, off Winchelsea in 1350. Yet, the French never invaded England and France's King John II died in captivity in England. There was a need for an English navy to play a role in this and to handle other matters, such as the insurrection of the Anglo-Irish lords and acts of piracy. By the early 1340s, it was clear that Edward's policy of alliances was too costly, and yielded too few results. The following years saw more direct involvement by English armies, including in the Breton War of Succession, but these interventions also proved fruitless at first. Edward defaulted on Florentine loans of 1,365,000 florins, resulting in the ruin of the lenders. A major change came in July 1346, when Edward staged a major offensive, sailing for Normandy with a force of 15,000 men. His army sacked the city of Caen, and marched across northern France, to meet up with English forces in Flanders. It was not Edward's initial intention to engage the French army, but at Crécy, just north of the Somme, he found favourable terrain and decided to fight a pursuing army led by Philip VI. On 26 August, the English army defeated a far larger French army in the Battle of Crécy. Shortly after this, on 17 October, an English army defeated and captured King David II of Scotland at the Battle of Neville's Cross. With his northern borders secured, Edward felt free to continue his major offensive against France, laying siege to the town of Calais. The operation was the greatest English venture of the Hundred Years' War, involving an army of 35,000 men. The siege started on 4 September 1346, and lasted until the town surrendered on 3 August 1347. After the fall of Calais, factors outside of Edward's control forced him to wind down the war effort. In 1348, the Black Death struck England with full force, killing a third or more of the country's population. This loss of manpower led to a shortage of farm labour, and a corresponding rise in wages. The great landowners struggled with the shortage of manpower and the resulting inflation in labour cost. To curb the rise in wages, the king and parliament responded with the Ordinance of Labourers in 1349, followed by the Statute of Labourers in 1351. These attempts to regulate wages could not succeed in the long run, but in the short term they were enforced with great vigour. All in all, the plague did not lead to a full-scale breakdown of government and society, and recovery was remarkably swift. This was to a large extent thanks to the competent leadership of royal administrators such as Treasurer William Edington and Chief Justice William de Shareshull. It was not until the mid-1350s that military operations on the Continent were resumed on a large scale. In 1356, Edward's eldest son, Edward, the Black Prince, won an important victory in the Battle of Poitiers. The greatly outnumbered English forces not only routed the French, but captured the French king, John II and his youngest son, Philip. After a succession of victories, the English held great possessions in France, the French king was in English custody, and the French central government had almost totally collapsed. There has been a historical debate as to whether Edward's claim to the French crown originally was genuine, or if it was simply a political ploy meant to put pressure on the French government. Regardless of the original intent, the stated claim now seemed to be within reach. Yet a campaign in 1359, meant to complete the undertaking, was inconclusive. In 1360, therefore, Edward accepted the Treaty of Brétigny, whereby he renounced his claims to the French throne, but secured his extended French possessions in full sovereignty. While Edward's early reign had been energetic and successful, his later years were marked by inertia, military failure and political strife. The day-to-day affairs of the state had less appeal to Edward than military campaigning, so during the 1360s Edward increasingly relied on the help of his subordinates, in particular William Wykeham. A relative upstart, Wykeham was made Keeper of the Privy Seal in 1363 and Chancellor in 1367, though due to political difficulties connected with his inexperience, the Parliament forced him to resign the chancellorship in 1371. Compounding Edward's difficulties were the deaths of his most trusted men, some from the 1361–62 recurrence of the plague. William Montague, Earl of Salisbury, Edward's companion in the 1330 coup, died as early as 1344. William de Clinton, who had also been with the king at Nottingham, died in 1354. One of the earls created in 1337, William de Bohun, Earl of Northampton, died in 1360, and the next year Henry of Grosmont, perhaps the greatest of Edward's captains, succumbed to what was probably plague. Their deaths left the majority of the magnates younger and more naturally aligned to the princes than to the king himself. Increasingly, Edward began to rely on his sons for the leadership of military operations. The king's second son, Lionel of Antwerp, attempted to subdue by force the largely autonomous Anglo-Irish lords in Ireland. The venture failed, and the only lasting mark he left were the suppressive Statutes of Kilkenny in 1366. In France, meanwhile, the decade following the Treaty of Brétigny was one of relative tranquillity, but on 8 April 1364 John II died in captivity in England, after unsuccessfully trying to raise his own ransom at home. He was followed by the vigorous Charles V, who enlisted the help of the capable Constable Bertrand du Guesclin. 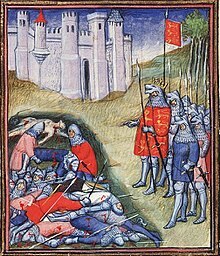 In 1369, the French war started anew, and Edward's younger son John of Gaunt was given the responsibility of a military campaign. The effort failed, and with the Treaty of Bruges in 1375, the great English possessions in France were reduced to only the coastal towns of Calais, Bordeaux, and Bayonne. Military failure abroad, and the associated fiscal pressure of constant campaigns, led to political discontent at home. The problems came to a head in the parliament of 1376, the so-called Good Parliament. The parliament was called to grant taxation, but the House of Commons took the opportunity to address specific grievances. In particular, criticism was directed at some of the king's closest advisors. Chamberlain William Latimer and Steward of the Household John Neville were dismissed from their positions. Edward's mistress, Alice Perrers, who was seen to hold far too much power over the ageing king, was banished from court. Yet the real adversary of the Commons, supported by powerful men such as Wykeham and Edmund de Mortimer, Earl of March, was John of Gaunt. Both the king and the Black Prince were by this time incapacitated by illness, leaving Gaunt in virtual control of government. Gaunt was forced to give in to the demands of parliament, but at its next convocation, in 1377, most of the achievements of the Good Parliament were reversed. Edward did not have much to do with any of this; after around 1375 he played a limited role in the government of the realm. Around 29 September 1376 he fell ill with a large abscess. After a brief period of recovery in February 1377, the king died of a stroke at Sheen on 21 June. He was succeeded by his ten-year-old grandson, King Richard II, son of the Black Prince, since the Black Prince himself had died on 8 June 1376. The middle years of Edward's reign were a period of significant legislative activity. Perhaps the best-known piece of legislation was the Statute of Labourers of 1351, which addressed the labour shortage problem caused by the Black Death. The statute fixed wages at their pre-plague level and checked peasant mobility by asserting that lords had first claim on their men's services. In spite of concerted efforts to uphold the statute, it eventually failed due to competition among landowners for labour. The law has been described as an attempt "to legislate against the law of supply and demand", which made it doomed to fail. Nevertheless, the labour shortage had created a community of interest between the smaller landowners of the House of Commons and the greater landowners of the House of Lords. The resulting measures angered the peasants, leading to the Peasants' Revolt of 1381. The reign of Edward III coincided with the so-called Babylonian Captivity of the papacy at Avignon. During the wars with France, opposition emerged in England against perceived injustices by a papacy largely controlled by the French crown. Papal taxation of the English Church was suspected to be financing the nation's enemies, while the practice of provisions – the Pope providing benefices for clerics – caused resentment in the English population. The statutes of Provisors and Praemunire, of 1350 and 1353 respectively, aimed to amend this by banning papal benefices, as well as limiting the power of the papal court over English subjects. The statutes did not sever the ties between the king and the Pope, who were equally dependent upon each other. Other legislation of importance includes the Treason Act 1351. It was precisely the harmony of the reign that allowed a consensus on the definition of this controversial crime. Yet the most significant legal reform was probably that concerning the Justices of the Peace. This institution began before the reign of Edward III but, by 1350, the justices had been given the power not only to investigate crimes and make arrests, but also to try cases, including those of felony. With this, an enduring fixture in the administration of local English justice had been created. Parliament as a representative institution was already well established by the time of Edward III, but the reign was nevertheless central to its development. During this period, membership in the English baronage, formerly a somewhat indistinct group, became restricted to those who received a personal summons to parliament. This happened as parliament gradually developed into a bicameral institution, composed of a House of Lords and a House of Commons. Yet it was not in the upper, but in the lower house that the greatest changes took place, with the expanding political role of the Commons. Informative is the Good Parliament, where the Commons for the first time – albeit with noble support – were responsible for precipitating a political crisis. In the process, both the procedure of impeachment and the office of the Speaker were created. Even though the political gains were of only temporary duration, this parliament represented a watershed in English political history. The political influence of the Commons originally lay in their right to grant taxes. The financial demands of the Hundred Years' War were enormous, and the king and his ministers tried different methods of covering the expenses. The king had a steady income from crown lands, and could also take up substantial loans from Italian and domestic financiers. To finance warfare on Edward III's scale, the king had to resort to taxation of his subjects. Taxation took two primary forms: levy and customs. The levy was a grant of a proportion of all moveable property, normally a tenth for towns and a fifteenth for farmland. This could produce large sums of money, but each such levy had to be approved by parliament, and the king had to prove the necessity. The customs therefore provided a welcome supplement, as a steady and reliable source of income. An "ancient duty" on the export of wool had existed since 1275. Edward I had tried to introduce an additional duty on wool, but this unpopular maltolt, or "unjust exaction", was soon abandoned. Then, from 1336 onwards, a series of schemes aimed at increasing royal revenues from wool export were introduced. After some initial problems and discontent, it was agreed through the Ordinance of the Staple of 1353 that the new customs should be approved by parliament, though in reality they became permanent. Through the steady taxation of Edward III's reign, parliament – and in particular the Commons – gained political influence. A consensus emerged that in order for a tax to be just, the king had to prove its necessity, it had to be granted by the community of the realm, and it had to be to the benefit of that community. In addition to imposing taxes, parliament would also present petitions for redress of grievances to the king, most often concerning misgovernment by royal officials. This way the system was beneficial for both parties. Through this process the commons, and the community they represented, became increasingly politically aware, and the foundation was laid for the particular English brand of constitutional monarchy. Central to Edward III's policy was reliance on the higher nobility for purposes of war and administration. While his father had regularly been in conflict with a great portion of his peerage, Edward III successfully created a spirit of camaraderie between himself and his greatest subjects. Both Edward I and Edward II had been limited in their policy towards the nobility, allowing the creation of few new peerages during the sixty years preceding Edward III's reign. The young king reversed this trend when, in 1337, as a preparation for the imminent war, he created six new earls on the same day. At the same time, Edward expanded the ranks of the peerage upwards, by introducing the new title of duke for close relatives of the king. Furthermore, Edward bolstered the sense of community within this group by the creation of the Order of the Garter, probably in 1348. A plan from 1344 to revive the Round Table of King Arthur never came to fruition, but the new order carried connotations from this legend by the circular shape of the garter. Edward's wartime experiences during the Crécy campaign (1346–7) seem to have been a determining factor in his abandonment of the Round Table project. It has been argued that the total warfare tactics employed by the English at Crécy in 1346 were contrary to Arthurian ideals and made Arthur a problematic paradigm for Edward III, especially at the time of the institution of the Garter. There are no formal references to King Arthur and the Round Table in the surviving early fifteenth-century copies of the Statutes of the Garter, but the Garter Feast of 1358 did involve a round table game. Thus there was some overlap between the projected Round Table fellowship and the actualized Order of the Garter. Polydore Vergil tells of how the young Joan of Kent, Countess of Salisbury – allegedly the king's favourite at the time – accidentally dropped her garter at a ball at Calais. King Edward responded to the ensuing ridicule of the crowd by tying the garter around his own knee with the words honi soit qui mal y pense – shame on him who thinks ill of it. This reinforcement of the aristocracy must be seen in conjunction with the war in France, as must the emerging sense of national identity. Just as the war with Scotland had done, the fear of a French invasion helped strengthen a sense of national unity, and nationalise the aristocracy that had been largely Anglo-Norman since the Norman conquest. Since the time of Edward I, popular myth suggested that the French planned to extinguish the English language, and as his grandfather had done, Edward III made the most of this scare. As a result, the English language experienced a strong revival; in 1362, a Statute of Pleading ordered the English language to be used in law courts, and the year after, Parliament was for the first time opened in English. At the same time, the vernacular saw a revival as a literary language, through the works of William Langland, John Gower and especially The Canterbury Tales by Geoffrey Chaucer. Yet the extent of this Anglicisation must not be exaggerated. The statute of 1362 was in fact written in the French language and had little immediate effect, and parliament was opened in that language as late as 1377. The Order of the Garter, though a distinctly English institution, included also foreign members such as John IV, Duke of Brittany and Sir Robert of Namur. Edward III – himself bilingual – viewed himself as legitimate king of both England and France, and could not show preferential treatment for one part of his domains over another. Influential as Stubbs was, it was long before this view was challenged. In a 1960 article, titled "Edward III and the Historians", May McKisack pointed out the teleological nature of Stubbs' judgement. A medieval king could not be expected to work towards some future ideal of a parliamentary monarchy as if it were good in itself; rather, his role was a pragmatic one—to maintain order and solve problems as they arose. At this, Edward III excelled. Edward had also been accused of endowing his younger sons too liberally and thereby promoting dynastic strife culminating in the Wars of the Roses. This claim was rejected by K.B. McFarlane, who argued that this was not only the common policy of the age, but also the best. Later biographers of the king such as Mark Ormrod and Ian Mortimer have followed this historiographical trend. The older negative view has not completely disappeared; as recently as 2001, Norman Cantor described Edward III as an "avaricious and sadistic thug" and a "destructive and merciless force." From what is known of Edward's character, he could be impulsive and temperamental, as was seen by his actions against Stratford and the ministers in 1340/41. At the same time, he was well known for his clemency; Mortimer's grandson was not only absolved, but came to play an important part in the French wars, and was eventually made a Knight of the Garter. Both in his religious views and his interests, Edward was a conventional man. His favourite pursuit was the art of war and, in this, he conformed to the medieval notion of good kingship. As a warrior he was so successful that one modern military historian has described him as the greatest general in English history. He seems to have been unusually devoted to his wife, Queen Philippa. Much has been made of Edward's sexual licentiousness, but there is no evidence of any infidelity on the king's part before Alice Perrers became his lover, and by that time the queen was already terminally ill. This devotion extended to the rest of the family as well; in contrast to so many of his predecessors, Edward never experienced opposition from any of his five adult sons. Woodstock Palace, Oxfordshire 8 June 1376 Married his cousin Joan, Countess of Kent, on 10 October 1361; had issue (King Richard II of England). Woodstock Palace, Oxfordshire April 1379 or 17 June/5 October 1382 Married Enguerrand VII de Coucy, 1st Earl of Bedford, on 27 July 1365; had issue. Antwerp 7 October 1368 Married (1) Elizabeth de Burgh, 4th Countess of Ulster, in 1352; had issue. Married (2) Violante Visconti on 28 May 1368; no issue. Kings Langley, Hertfordshire 1 August 1402 Married (1) Infanta Isabella of Castile, sister of Gaunt's second wife; had issue. Married (2) Joan Holland (his 2nd cousin) in 1392; no issue. Bishop's Waltham, Hampshire September 1361 Married John IV, Duke of Brittany, on 3 July 1361; no issue. Windsor 1 October/25 December 1361 Married John Hastings, 2nd Earl of Pembroke, on 13 May 1359; no issue. Windsor before 5 September 1348 Died in infancy. Buried at Westminster Abbey. Edward's claim on the French throne was based on his descent from King Philip IV of France, through his mother Isabella. ^ Edward first styled himself "King of France" in 1337, though he did not assume the title until 1340; Prestwich (2005), pp. 307–8. ^ Mortimer (2006), p. 1. ^ Mortimer (2006), p. 21. ^ For an account of the political conflicts of Edward II's early years, see: Maddicot, J.R. (1970). Thomas of Lancaster, 1307–1322. Oxford: Oxford University Press. ISBN 0-19-821837-0. OCLC 132766. ^ Tuck (1985), p. 52. ^ Prestwich (1980), p. 80. ^ Tuck (1985), p. 88. ^ For an account of Edward II's later years, see: Fryde, N.M. (1979). The tyranny and fall of Edward II, 1321–1326. Cambridge: Cambridge University Press. ISBN 0-521-54806-3. ^ Mortimer (2006), p. 39. ^ Prestwich (2005), p. 213. ^ Prestwich (2005), p. 216. ^ Mortimer (2006), p. 46. ^ McKisack (1959), pp. 98–100. ^ Mortimer (2006), pp. 67, 81. ^ Prestwich (2005), pp. 223–4. ^ Preswich (2005), p. 244. ^ DeVries (1996), pp. 114–5. ^ Preswich (2205), pp. 244–5. ^ a b Ormrod (1990), p. 21. ^ McKisack (1959), pp. 117–9. ^ Edward did not officially assume the title "King of England and France" until 1340; Ormrod (1990), pp. 21–2. ^ Sumption (1999), p. 106. ^ Rogers (2000), p. 155. ^ McKisack (1959), pp. 128–9. ^ Prestwich (2005), pp. 273–5. ^ McKisack (1959), p. 168. ^ Jones (2013), pp. 385–390. ^ Fryde (1975), pp. 149–161. ^ Prestwich (2005), pp. 275–6. ^ McKisack (1959), pp. 174–5. ^ Ormrod (1990), p. 29. ^ Mortimer (2006), p. 205. The main exception was Henry of Lancaster's victory in the Battle of Auberoche in 1345; Fowler (1969), pp. 58–9. ^ Durant, Will (1953). The Story of Civilization: The Renaissance. New York City: Simon and Shuster. ISBN 978-1567310238. ^ McKisack (1959), p. 132. ^ Prestwich (2005), pp. 316–8. ^ DeVries (1996), pp. 155–76. ^ Waugh (1991), p. 17. ^ Ormrod (1990), p. 31. ^ Sumption (1999), pp. 537, 581. ^ For more on the debate over mortality rates, see: Hatcher, John (1977). Plague, Population and the English Economy, 1348–1530. London: Macmillan. pp. 11–20. ISBN 0-333-21293-2. ^ Waugh (1991), p. 109. ^ Prestwich (2005), pp. 547–8. ^ Prestwich (2005), p. 553. ^ Ormrod (1986), pp. 175–88. ^ Prestwich (2005), p. 550. ^ McKisack (1959), p. 139. ^ McKisack (1959), pp. 139–40. ^ For a summary of the debate, see: Prestwich (2005), pp. 307–10. ^ Prestwich (2005), p. 326. ^ Ormrod (1990), pp. 39–40. ^ For more on Wykeham, see: Davis, Virginia (2007). William Wykeham. Hambledon Continuum. ISBN 978-1-84725-172-5. ^ Ormrod (1990), pp. 90–4. ^ Fowler (1969), pp. 217–8. ^ Ormrod (1990), pp. 127–8. ^ McKisack (1959), p. 231. ^ Tuck (1985), p. 138. ^ Ormrod (1990), p. 27. ^ McKisack (1959), p. 145. ^ Holmes (1975), p. 66. ^ McKisack (1959), pp. 387–94. ^ Harriss (2006), p. 440. ^ The earlier belief that Gaunt "packed" the 1377 parliament with his own supporters is no longer widely held. See: Wedgwood, Josiah C. (1930). "John of Gaunt and the Packing of Parliament". The English Historical Review. XLV (CLXXX): 623–625. doi:10.1093/ehr/XLV.CLXXX.623. ISSN 0013-8266. ^ a b Ormrod (1990), p. 52. ^ McKisack (1959), p. 335. ^ Hanawalt, Barbara A. (9 February 1989). The ties that bound: peasant families in medieval England. Oxford University Press US. p. 139. ISBN 978-0-19-504564-2. ^ McKisack (1959), p. 272. ^ McKisack (1959), pp. 280–1. ^ Ormrod (1990), pp. 140–3. ^ McKisack (1959), p. 257. ^ The pioneering study of this process is: Putnam, B.H. (1929). "The Transformation of the Keepers of the Peace into the Justices of the Peace 1327–1380". Transactions of the Royal Historical Society. 12: 19–48. doi:10.2307/3678675. ISSN 0080-4401. ^ Musson and Omrod (1999), pp. 50–4. ^ Harriss (2006), p. 66. ^ McKisack (1959), pp. 186–7. ^ Harriss (2006), p. 67. ^ Prestwich (1980), p. 288. ^ Fritze, Ronald H.; Robison, William Baxter (2002). Historical dictionary of late medieval England, 1272–1485. Greenwood Publishing Group. p. 409. ISBN 978-0-313-29124-1. Retrieved 8 May 2011. ^ Ormrod (1990), pp. 60–1. ^ Brown (1989), pp. 80–4. ^ Brown (1989), pp. 70–1. ^ Harriss (1975), pp. 57, 69. ^ Brown (1989), pp. 67–9, 226–8. ^ Harriss (1975), p. 509. ^ Prestwich (2005), pp. 282–3. ^ Harriss (1975), pp. 509–17. ^ a b Ormrod (1990), pp. 114–5. ^ Given-Wilson (1996), pp. 29–31. ^ Given-Wilson (1996), pp. 35–6. ^ Prestwich (2005), p. 364. ^ Tuck (1985), p. 133. ^ Berard, Christopher (2012). "Edward III's Abandoned Order of the Round Table". Arthurian Literature. 29: 1–40. JSTOR 10.7722/j.ctt1x71zc. ^ Berard, Christopher (2016). "Edward III's Abandoned Order of the Round Table Revisited: Political Arthurianism after Poitiers". Arthurian Literature. 33: 70–109. ^ McKisack (1959), pp. 251–2. ^ Prestwich (1980), pp. 209–10. ^ For the original text, see: "Statute of Pleading (1362)". languageandlaw.org. Loyola Law School. Retrieved 8 May 2011. ^ McKisack (1959), p. 524. ^ McKisack (1959), pp. 526–32. ^ Prestwich (2005), p. 556. ^ McKisack (1959), p. 253. ^ Prestwich (2005), p. 554. ^ Ormrod (1990), p. 51. ^ Stubbs, William (1880). The Constitutional History of England. ii. Oxford: Clarendon. p. 3. ^ McKisack (1960), pp. 4–5. ^ McFarlane, K.B. (1981). England in the Fifteenth Century: Collected Essays. Continuum International Publishing Group. p. 238. ISBN 978-0-907628-01-9. Retrieved 8 May 2011. ^ Cantor, Norman (2002). In the Wake of the Plague: The Black Death and the World it Made. HarperCollins. pp. 37, 39. ISBN 0-06-001434-2. ^ Prestwich (2005), p. 289. ^ McKisack (1959), p. 255. ^ Ormrod (1990), p. 56. ^ Prestwich (2005), pp. 290–1. ^ Rogers, C.J. (2002). "England's Greatest General". MHQ: the Quarterly Journal of Military History. 14 (4): 34–45. ^ Mortimer (2006), pp. 400–1. ^ Prestwich (1980), p. 241. ^ Prestwich (2005), p. 290. ^ The Perfect King: The Life of Edward III Father of the English Nation, Ian Mortimer, Vintage Books London, 2006. Allmand, Christopher (1988). The Hundred Years War: England and France at War c. 1300 – c. 1450. Cambridge: Cambridge University Press. ISBN 0-521-26499-5. Ayton, Andrew (1994). Knights and Warhorses: Military Service and the English Aristocracy under Edward III. Woodbridge: Boydell Press. ISBN 0-85115-568-5. Barrow, G.W.S. (1965). Robert Bruce and the Community of the Realm of Scotland. London: Eyre & Spottiswoode. Berard, Christopher (2012). "Edward III's Abandoned Order of the Round Table". Arthurian Literature. 29: 1–40. JSTOR 10.7722/j.ctt1x71zc. Bothwell, J. (1997-11-01). "Edward III and the 'New Nobility': Largesse and Limitation in Fourteenth-Century England". The English Historical Review. 112 (449): 1111–1140. doi:10.1093/ehr/CXII.449.1111. JSTOR 577101. Bothwell, J. (2001). The Age of Edward III. York: Boydell Press. ISBN 1-903153-06-9. Bothwell, J. (2004). Edward III and the English Peerage: Royal Patronage, Social Mobility and Political Control in Fourteenth-Century England. Ipswich: Boydell Press. ISBN 1-84383-047-7. Bothwell, J. (2008). "The more things change: Isabella and Mortimer, Edward III and the painful delay of a royal majority". In Beem Charles. The Royal Minorities of Medieval and Early Modern England. New York: Palgrave Macmillan. pp. 67–102. ISBN 0-230-60866-3. Curry, Anne (1993). The Hundred Years' War. Basingstoke: Macmillan. ISBN 0-333-53175-2. Graham Cushway (2011). Edward III and the war at sea: the English Navy, 1327–1377. Boydell. ISBN 978-1-84383-621-6. Retrieved 11 February 2012. Fowler, K.H. (1969). 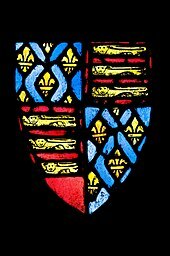 The King's Lieutenant: Henry of Grosmont, First Duke of Lancaster, 1310–1361. London: Elek. ISBN 0-236-30812-2. Fryde, E. B. (1983-07-01). Studies in Medieval Trade and Finance. London: Hambledon Press. ISBN 978-0-907628-10-1. Fryde, N.M. (1975). "Edward III's Removal of his Ministers and Judges, 1340–1". Bulletin of the Institute of Historical Research. 48 (118): 149–61. doi:10.1111/j.1468-2281.1975.tb00747.x. Given-Wilson, Chris (1986). The Royal Household and the King's Affinity: Service, Politics, and Finance in England, 1360–1413. New Haven, CT, US: Yale University Press. ISBN 0-300-03570-5. Given-Wilson, Chris (1996). The English Nobility in the Late Middle Ages. London: Routledge. ISBN 0-415-14883-9. Goodman, Anthony (1992). John of Gaunt: the exercise of princely power in fourteenth-century Europe. Longman. ISBN 978-0-582-09813-8. Retrieved 30 April 2011. Harriss, G.L. (2006). Shaping the Nation: England 1360–1461. Oxford University Press. ISBN 978-0-19-921119-7. Retrieved 8 May 2011. Hewitt, H.J. (2005). The Organisation of War under Edward III. Pen and Sword. ISBN 1-84415-231-6. Holmes, George (1975). The Good Parliament. Clarendon Press. ISBN 978-0-19-822446-4. Jones, Dan (2013). The Plantagenets: The Warrior Kings and Queens Who Made England. Viking. ISBN 978-0-670-02665-4. McKisack, M. (1959-12-31). The Fourteenth Century 1307–1399. Oxford History of England. 5. Oxford: Clarendon Press. ISBN 978-0-19-821712-1. McKisack, M. (1960). "Edward III and the historians". History. 45 (153): 1–15. doi:10.1111/j.1468-229X.1960.tb02288.x. JSTOR 24403881. Morgan, D.A.L. (1997-09-01). "The Political After-Life of Edward III: The Apotheosis of a Warmonger". The English Historical Review. 112 (448): 856–81. doi:10.1093/EHR/CXII.448.856. JSTOR 576696. Munby, Julian; Barber, Richard W.; Brown, Richard (2007). Edward III's Round Table at Windsor: The House of the Round Table and the Windsor Festival of 1344. Arthurian Studies. Ipswich: Boydell Press. ISBN 1-84383-313-1. Musson, A. and W.A. Omrod (1999). The Evolution of English Justice. Basingstoke: Macmillan. ISBN 0-333-67670-X. Ormrod, Mark (1986). "The English government and the Black Death of 1348–49". In Mark Ormrod. England in the Fourteenth Century. Woodbridge: Boydell. pp. 175–88. ISBN 0-85115-448-4. Ormrod, W.M. (1987a). "Edward III and the Recovery of Royal Authority in England, 1340–60". History. 72 (234): 4–19. doi:10.1111/j.1468-229X.1987.tb01455.x. JSTOR 24415599. Ormrod, W.M. (1987b). "Edward III and His Family". Journal of British Studies. 26 (4): 398–422. doi:10.1086/385897. JSTOR 175720. Ormrod, W.M. (February 2005) . Edward III. Tempus. ISBN 978-0-7524-3320-2. Ormrod, W.M. (1994). "England, Normandy and the beginnings of the hundred years war, 1259–1360". In Bates, David; Curry Anne. England and Normandy in the Middle Ages. London: Hambledon. pp. 197–213. ISBN 978-1-85285-083-8. Retrieved 30 April 2011. Ormrod, W.M. (2008-01-03). "Edward III (1312–1377)". Oxford Dictionary of National Biography (online). Oxford University Press. doi:10.1093/ref:odnb/8519. Rogers, C.J., ed. (1999). The Wars of Edward III: Sources and Interpretations. Woodbridge: Boydell Press. ISBN 0-85115-646-0. Sumption, Jonathan (1999). Trial by Battle (The Hundred Years War I). London: Faber and Faber. ISBN 0-571-20095-8. Sumption, Jonathan (2001). Trial by Fire (The Hundred Years War II). London: Faber and Faber. ISBN 0-571-20737-5. Verduyn, Anthony (1993-10-01). "The Politics of Law and Order during the Early Years of Edward III". The English Historical Review. 108 (429): 842–867. doi:10.1093/ehr/CVIII.CCCCXXIX.842. JSTOR 575533. Ziegler, Phillip (1969). The Black Death. London: Collins. ISBN 0-00-211085-7. "Edward III." . Encyclopædia Britannica (11th ed.). 1911. "Edward III". Dictionary of National Biography. 17. 1889. "Archival material relating to Edward III of England". UK National Archives.